One of my favorite things to ask my daughter is what she wants to be when she grows up. It is my favorite because of her answer which is a fire fighter because she wants to help people. I am so proud of how caring she is at the young age of three. She will probably move onto another future dream career, as many kids do, but for now I am very into nurturing that interest of hers. One of the ways we did that this past year was to visit a fire fighter museum on our cross country road trip. Another way this can be done is with fire fighter themed toys. That is why one of her Christmas presents this year is the Green Toys Fire Station Playset. *Provided to me in exchange for my honest opinion. 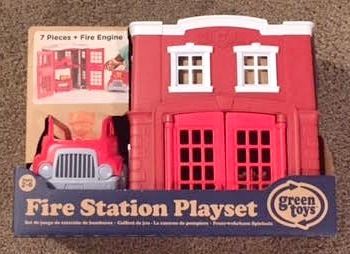 The Green Toys Fire Station Playset is Green. Obviously the fire station is red but it is green because it is made entirely out of recyclable plastics. This means it is eco-friendly, safe for your children and is dishwasher safe. 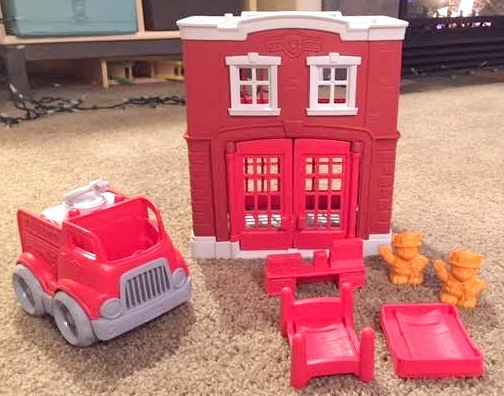 It is so important to give our children safe toys and this fire station is BPA, phthalate and PVC free. You don’t just get a fire station but accessories as well. Included with the fire station is a fire truck. On the fire truck it has a rotating fire hose that is not attached. Along with those items you get two firefighting cats, their bunk bed and a computer station. This helps show children many sides of a fire fighter’s life. 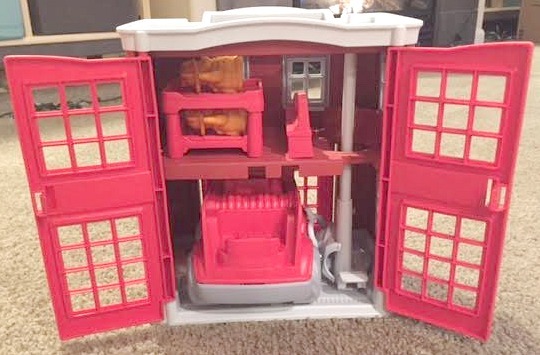 Everything fits inside the fire station for easy storage. One of my biggest pet peeves is when my children get toys that cannot be stored easily. With the Green Toys fire station this is not a worry because everything included can fit inside the station at the same time. This also provides for fun play time because children can move everything around in different ways depending on how they want to play. On top of the playset is a handle which makes moving the fire station from storage to play easy as well. The best feature of the fire station is it’s moving fire pole. 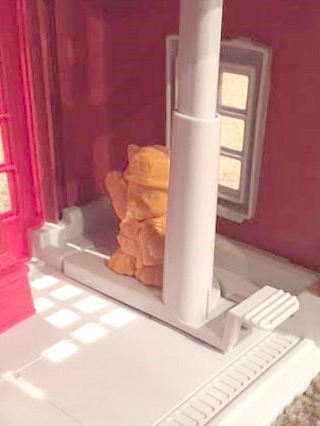 The cat fire fighters easily fit onto the movable fire pole. Then to move it you push up or down on the lifted part of the pole. They can move from the top floor after sleeping to the bottom floor and get into the fire truck. Who do you know that would love a fire station playset for Christmas?